Like many other Heuer models, this Heuer Daytona reference 110.203B was named after a racetrack. Daytona International Speedway in Florida was the epitome of motorsport in the 1960s and 1970s. No wonder that Rolex has named its only chronograph after this racetrack. The Heuer Daytona was launched around 1976. With its new design it should stand out from the models Carrera, Autavia and Monaco. 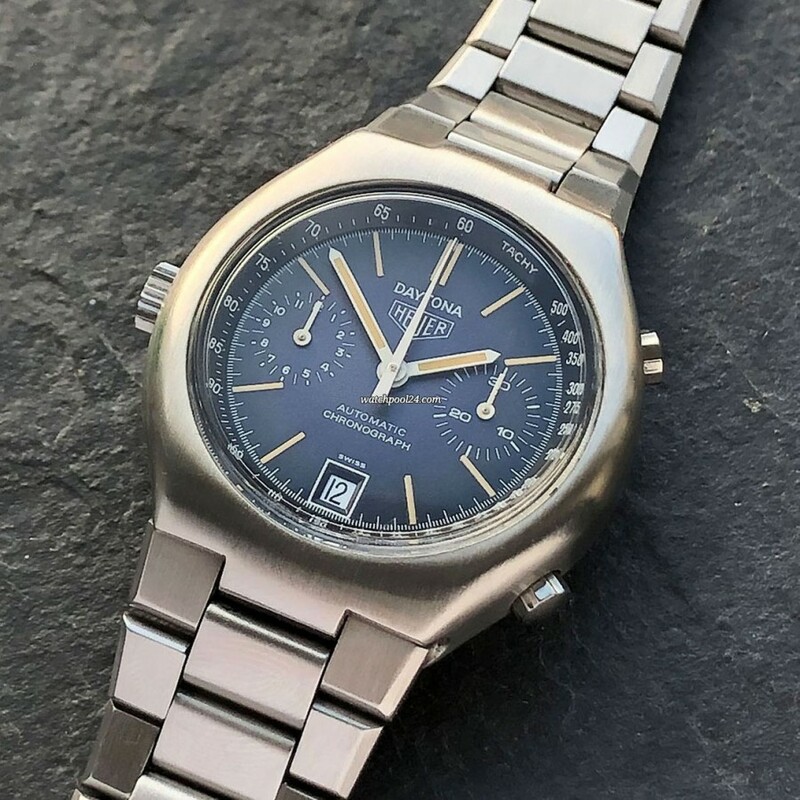 Due to the short production time of about 4 years (1976 - 1980), it is today very difficult to find an example of the Heuer Daytona in great condition. The reference number of the Heuer Daytona is 110.203B. The B stands for the stunning blue dial. It has a gradient from the middle to the edge, which is also called Dégradé finish. The dial has long hour markers that improve readability. The tachymeter scale is attached to the dial rim. The minute counter is positioned at 3 o'clock, the hour counter at 9 o'clock and the silver-framed date window at 6 o'clock. The Heuer Daytona stainless steel case, in contrast to other Heuer models, has no sharp edges but smooth curves. This gives the watch a harmonious overall look. The Heuer Daytona was available exclusively with a stainless steel bracelet which is integrated into the watch. The movement of this chronograph is the Heuer automatic caliber 12. The Heuer Daytona belongs to the last series of Heuer chronographs with the in-house automatic caliber. The following models were powered by the Valjoux 7750. The condition of this example is like new. The case has hardly any traces of usage. The engraved numbers on the case back are clearly legible. The dial is absolutely flawless with intact original tritium in the hands and hour markers. The bracelet is in great condition with few signs of wear. The clasp is signed with the Heuer logo. The Heuer Daytona Chronograph delights with the charm of the 70s and is very present on the wrist.